One of the smallest growing rowans, making either an elegant small tree or a large shrub and very useful where space is limited. Delicate, fern-like pinnate leaves. 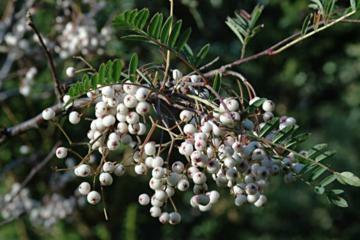 White spring flowers are followed by clusters of berries in autumn, red at first then ripening through pink to white. Good autumn colour. Best in moderately fertile, moist, well drained soil, preferably neutral to acid, but quite tolerant of most reasonable conditions, but not periods of drought. Sun or light dappled shade. Introduced from China by Abbé Delavay in 1889.